Includes various dependencies header files needed by most everything. It also declares structures and other variables that the GUI portion needs. Definition at line 41 of file client.h. Referenced by keybindings_init(), parse_keys_file(), and update_login_info(). Definition at line 638 of file client.h. Definition at line 13 of file client.h. Do not send more than this many outstanding commands to the server this is only a default value. Definition at line 76 of file client.h. Referenced by init_config(), and set_command_window(). Definition at line 65 of file client.h. Definition at line 62 of file client.h. Referenced by init_config(), and parse_meta(). Map size the client will request the map to be. The bigger it is, more memory it will use. Definition at line 475 of file client.h. Referenced by config_check(), and map_check_resize(). Definition at line 40 of file client.h. Referenced by AccountPlayersCmd(), add_character_to_account(), bind_key(), cache_newpng(), client_negotiate(), command_help(), command_show(), common_item_command(), config_load_legacy(), configure_keys(), create_new_character(), cs_print_string(), do_account_change(), do_account_create(), do_account_login(), do_clienthelp_list(), draw_stats(), extended_command(), fire_dir(), get_image_info(), get_key_info(), get_number(), handle_local_command(), image_process_line(), init_common_cache_data(), init_theme(), inscribe_magical_scroll(), keybind_overwrite_confirm(), keybinding_get_data(), main(), on_spell_cast_clicked(), on_spell_invoke_clicked(), on_spell_treeview_row_activated(), parse_key(), play_character(), PlayerCmd(), print_inventory(), run_dir(), save_keys(), save_msgctrl_configuration(), script_init(), script_process_cmd(), script_tell(), send_command(), send_create_player_to_server(), send_mark_obj(), SetupCmd(), show_help(), show_keys(), SockList_AddChar(), SockList_AddInt(), SockList_AddShort(), SockList_AddString(), stats_get_styles(), stats_init(), toggle_keybind_scope(), toggle_locked(), trigger_skill(), unbind_key(), update_all_stats(), update_skill_information(), update_spell_information(), and UpdateItemCmd(). How many spaces an object might extend off the map. E.g. For bigimage stuff, the head of the image may be off the the map edge. This is the most it may be off. This is needed To cover case of need_recenter_map routines. Definition at line 491 of file client.h. How many skill types server supports/client will get sent to it. If more skills are added to server, this needs to get increased. Definition at line 84 of file client.h. Referenced by client_init(), client_reset(), draw_stats(), get_skill_info(), reset_player_data(), script_process_cmd(), update_skill_information(), and update_stat_mapping(). Definition at line 59 of file client.h. Definition at line 86 of file client.h. Referenced by AnimCmd(), and mapdata_animation(). Definition at line 499 of file client.h. Referenced by create_and_rescale_image_from_data(), get_map_image_size(), init_common_cache_data(), init_image_cache_data(), reset_image_cache_data(), and reset_image_data(). Definition at line 624 of file client.h. This is the smallest the map structure used for the client can be. It needs to be bigger than the MAP_MAX_SIZE simply because we have to deal with off map big images, Also, the center point is moved around within this map, so that if the player moves one space, we don't have to move around all the data. Definition at line 484 of file client.h. Definition at line 569 of file client.h. Referenced by character_data_ok(), create_character_set_sensitive(), init_create_character_window(), new_char_window_update_info(), on_combobox_rcs_changed(), process_race_class_info(), send_create_player_to_server(), and update_all_stats(). Translation of the STAT_RES names into printable names, in matching order. Definition at line 451 of file client.h. Referenced by draw_stats(), and update_stat_mapping(). Definition at line 37 of file client.h. Referenced by client_connect(), and read_config_dialog(). Definition at line 78 of file client.h. Definition at line 67 of file client.h. Referenced by ms_check_version(), SendVersion(), and VersionCmd(). Definition at line 68 of file client.h. Used mostly in the cache.c file, however, it can be returned to the graphic side of things so that they can update the image_data field. Since the common side has no idea what data the graphic side will point to, we use a void pointer for that - it is completely up to the graphic side to allocate/deallocate and cast that pointer as needed. Definition at line 45 of file client.h. One struct that holds most of the image related data to reduce danger of namespace collision. Definition at line 644 of file client.h. Definition at line 139 of file client.h. Warning that something definitely didn't work. Definition at line 440 of file client.h. Definition at line 144 of file client.h. Open a socket to the given hostname and store connection information. Closes the connection to the server. It seems better to have it one place here than the same logic sprinkled about in half a dozen locations. It is also useful in that if this logic does change, there is just one place to update it. Definition at line 180 of file client.c. References ClientSocket::fd, LOG(), and LOG_DEBUG. 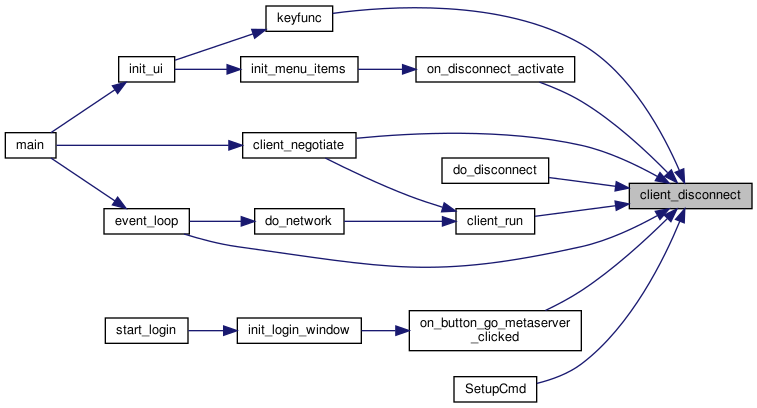 Referenced by client_negotiate(), client_run(), do_disconnect(), keyfunc(), on_button_go_metaserver_clicked(), on_disconnect_activate(), and SetupCmd(). Definition at line 640 of file client.h. Return a source triggered when input from the server is available. Definition at line 293 of file client.c. Definition at line 289 of file client.c. Referenced by do_network(), and on_disconnect_activate(). Ask the server for the given map size. Definition at line 170 of file client.c. References CONFIG_MAPHEIGHT, CONFIG_MAPWIDTH, cs_print_string(), ClientSocket::fd, height, mapdata_set_size(), use_config, and width. Referenced by client_negotiate(), and map_check_resize(). This function negotiates the characteriistics of a connection to the server. Negotiation consists of asking the server for commands it wants, and checking protocol version for compatibility. Serious incompatibilities abort the connection. sound Non-zero to ask for sound and music commands. Definition at line 298 of file client.c. References Face_Information_struct::cache_hits, Face_Information_struct::cache_misses, client_disconnect(), client_mapsize(), client_run(), CONFIG_CACHE, CONFIG_DOWNLOAD, CONFIG_LIGHTING, CONFIG_MAPHEIGHT, CONFIG_MAPWIDTH, CONFIG_SMOOTH, cs_print_string(), ClientSocket::cs_version, draw_ext_info(), face_info, Face_Information_struct::faceset, ClientSocket::fd, image_update_download_status(), LOG(), LOG_ERROR, LOG_WARNING, MAX_BUF, MSG_TYPE_CLIENT, MSG_TYPE_CLIENT_CONFIG, NDI_GOLD, Face_Information_struct::num_images, replyinfo_last_face, replyinfo_status, requestinfo_sent, RI_IMAGE_INFO, RI_IMAGE_SUMS, ClientSocket::sc_version, SendAddMe(), SendVersion(), serverloginmethod, use_config, want_config, Face_Information_struct::want_faceset, and wantloginmethod. Read available packets from the server and handle commands until there are no more, or if a socket error occurs. Definition at line 187 of file client.c. References SockList::buf, client_disconnect(), CmdMapping::cmdformat, CmdMapping::cmdname, CmdMapping::cmdproc, ClientSocket::fd, SockList::len, LOG(), LOG_ERROR, MAXSOCKBUF, NCOMMANDS, script_watch(), and SockList_ReadPacket(). Referenced by client_negotiate(), and do_network(). Write the given data to the server. Definition at line 1128 of file commands.c. Referenced by animate_inventory(), animate_look(), animate_objects(), draw_inv_table(), mapdata_animation(), and mapdata_set_anim_layer(). Definition at line 53 of file client.c. Referenced by cache_newpng(), finish_face_cmd(), init_common_cache_data(), and init_paths(). Definition at line 98 of file commands.c. Referenced by client_reset(), create_character_window_show(), get_class_info(), new_char_window_update_info(), on_combobox_rcs_changed(), ReplyInfoCmd(), and send_create_player_to_server(). Definition at line 52 of file client.c. Referenced by config_load(), init_paths(), init_theme(), keybindings_init(), save_keys(), and save_msgctrl_configuration(). See common/init.c - number mapping used when loading/saving the values. Definition at line 30 of file init.c. Referenced by config_load(), config_load_legacy(), and save_defaults(). Definition at line 68 of file client.c. Referenced by AddspellCmd(), animate_objects(), bind_key(), client_init(), command_take(), configure_keys(), DeleteSpell(), do_inv(), do_timeout(), draw_inv(), draw_inv_list(), draw_inv_table(), draw_lists(), draw_look_list(), draw_magic_map(), draw_message_window(), draw_stats(), extended_command(), fire_dir(), focusoutfunc(), get_item_env(), gtk_command_history(), handle_query(), hide_main_client(), item_actions(), keybindings_init(), keyfunc(), list_item_action(), load_theme(), locate_item(), magic_map_flash_pos(), MagicMapCmd(), metaserver_connect_to(), metaserver_show_prompt(), new_player(), on_entry_commands_activate(), on_switch_page(), parse_key(), parse_key_release(), redraw(), remove_item(), reset_player_data(), reset_vars_common(), save_keys(), script_init(), script_process_cmd(), send_command(), send_reply(), StatsCmd(), stop_fire(), toggle_keybind_scope(), update_skill_information(), update_spell_information(), UpdspellCmd(), and x_set_echo(). Definition at line 69 of file client.c. Referenced by add_character_to_account(), client_send_apply(), client_send_examine(), client_send_move(), cmd_raw(), command_take(), CompleteCmd(), create_character_window_show(), create_new_character(), do_account_change(), do_account_create(), do_account_login(), draw_stats(), get_image_info(), get_new_char_info(), inscribe_magical_scroll(), keybindings_init(), look_at(), metaserver_connect_to(), play_character(), read_config_dialog(), ReplyInfoCmd(), requestface(), reset_vars_common(), save_keys(), script_init(), script_process_cmd(), send_command(), send_create_player_to_server(), send_mark_obj(), send_reply(), set_item_values(), SetupCmd(), SockList_ReadPacket(), toggle_locked(), and VersionCmd(). Definition at line 64 of file client.c. Referenced by client_init(), draw_message_window(), get_exp_info(), and update_skill_information(). Definition at line 63 of file client.c. Definition at line 169 of file image.c. Referenced by client_init(), client_negotiate(), client_reset(), config_load(), config_load_legacy(), load_image(), read_config_dialog(), reset_vars_common(), save_defaults(), setup_config_dialog(), and SetupCmd(). Definition at line 1217 of file commands.c. Referenced by getTextManager(), and setTextManager(). maps position to skill id with trailing zero as stop mark. Definition at line 55 of file client.c. Referenced by client_init(), and use_skill(). Definition at line 58 of file client.c. Referenced by do_network(), and init_sockets(). Definition at line 555 of file client.h. Referenced by client_reset(), ReplyInfoCmd(), and update_login_info(). Definition at line 90 of file commands.c. Referenced by client_reset(), get_class_info(), new_char_window_update_info(), and ReplyInfoCmd(). Definition at line 87 of file commands.c. Referenced by client_reset(), get_race_info(), new_char_window_update_info(), and ReplyInfoCmd(). Definition at line 37 of file map.c. Referenced by expand_clear_bigface(), expand_set_bigface(), ExtSmooth(), mapdata_animation(), mapdata_bigface(), mapdata_clear_old(), mapdata_clear_space(), mapdata_face(), mapdata_init(), mapdata_scroll(), mapdata_set_anim_layer(), mapdata_set_check_space(), mapdata_set_darkness(), mapdata_set_face_layer(), mapdata_set_size(), mapdata_set_smooth(), recenter_virtual_map_view(), and script_process_cmd(). Referenced by client_reset(), create_character_window_show(), new_char_window_update_info(), on_combobox_rcs_changed(), and send_create_player_to_server(). Referenced by client_negotiate(), and get_image_sums(). Definition at line 57 of file client.c. Referenced by client_negotiate(), and get_image_info(). Definition at line 66 of file client.c. Definition at line 72 of file client.c. Definition at line 59 of file client.c. Referenced by client_negotiate(), client_reset(), on_button_create_character_clicked(), and start_login(). Referenced by draw_stats(), update_skill_information(), and update_stat_mapping(). Definition at line 50 of file client.c. Referenced by AddspellCmd(), client_init(), client_reset(), draw_stats(), get_skill_info(), script_process_cmd(), and update_stat_mapping(). Definition at line 51 of file client.c. Definition at line 99 of file commands.c. Referenced by on_combobox_starting_map_changed(), send_create_player_to_server(), and starting_map_update_info(). Definition at line 96 of file commands.c. Referenced by character_data_ok(), create_character_set_sensitive(), free_all_starting_map_info(), get_starting_map_info(), send_create_player_to_server(), and starting_map_update_info(). Definition at line 118 of file commands.c. Referenced by init_create_character_window(), on_combobox_rcs_changed(), and send_create_player_to_server(). Definition at line 95 of file commands.c. Referenced by get_new_char_info(), new_char_window_update_info(), and reset_vars_common(). Definition at line 94 of file commands.c. Definition at line 93 of file commands.c. Referenced by character_data_ok(), create_character_window_show(), get_new_char_info(), new_char_window_update_info(), reset_vars_common(), and update_all_stats(). Definition at line 61 of file client.c. Referenced by animate_inventory(), animate_look(), do_timeout(), and TickCmd(). Definition at line 40 of file init.c. Referenced by client_connect(), client_mapsize(), client_negotiate(), command_foodbeep(), config_check(), config_load(), create_and_rescale_image_from_data(), create_map_image(), display_mapscroll(), display_newpng(), draw_map(), draw_message_window(), Face2Cmd(), focusoutfunc(), free_pixmap(), gtk_map_redraw(), init_config(), init_image_cache_data(), keyfunc(), main(), map_button_event(), map_draw_layer(), map_init(), mapcell_draw_darkness(), MusicCmd(), on_entry_commands_activate(), parse_key(), parse_key_release(), read_config_dialog(), script_process_cmd(), send_command(), set_command_window(), set_darkness(), SetupCmd(), Sound2Cmd(), and update_stat(). Definition at line 91 of file commands.c. Definition at line 88 of file commands.c. Definition at line 48 of file client.c. Referenced by main(), parse_args(), and SendVersion(). Referenced by add_marked_text_to_pane(), client_negotiate(), command_foodbeep(), config_check(), config_load(), config_load_legacy(), draw_ext_info(), init_common_cache_data(), init_config(), main(), map_check_resize(), mapdata_scroll(), read_config_dialog(), reset_image_cache_data(), reset_image_data(), save_defaults(), set_command_window(), and setup_config_dialog(). Referenced by client_negotiate(), and init_sockets().